Disclaimer:Purpose of this article is to recover lost IMEI,please don’t use it for any illegal activities. I am no way responsible if you ruin or brick your phone during this process. If you have taken nvram backup of your unrooted non-modified rom previously (Through this method) then restore IMEI through that.For restoration use this scatter file for Coolpad Note 3. Your mobile must be rooted for this method. 11.Hit send command and Restart your phone. 2.Download Android_Gadget_CDC(drivers) and install it.For installation method Go here. 3.Now run maui meta tool and select “Options”,then “Connect Smart phone into Meta mode” and check it. 5.Switch off phone and connect to pc through usb cable. 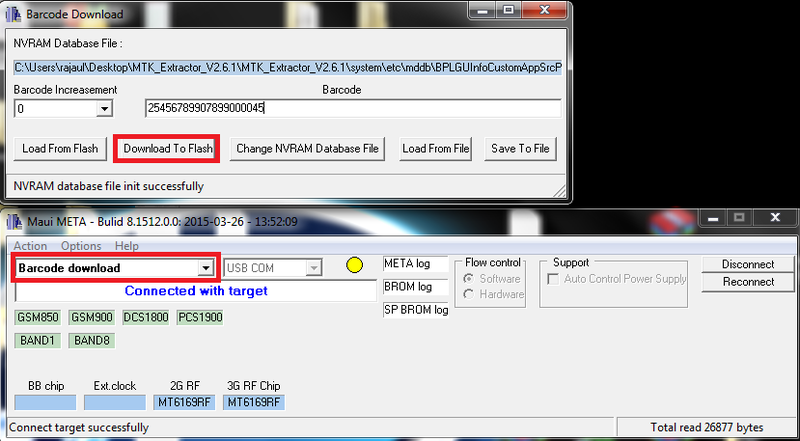 9.Click on Change NVRAM database files and select your database file:Coolpad Note 3 users can use this file. 11.Repeat step 10 for Second SIM and enter IMEI of second SIM. 15.Click on “Download to flash”. 17.Now Click on "disconnect",Switch on and check your IMEI and Serial Number. Sir I have tried to install it . but while opening application it says"enumerate com port failed"
Hi I am lost imei number on coolpad note 3. I have installed the 360 OS and i am not seeing CDS information tab in connectivity of engineering mode. Please help me ! Second Method worked. Thank you so much. ps : IMEI Number is to be put itself in inverted commas!